What joy and dancing and fun and ok, yes, some showing off, but in a delightful way! 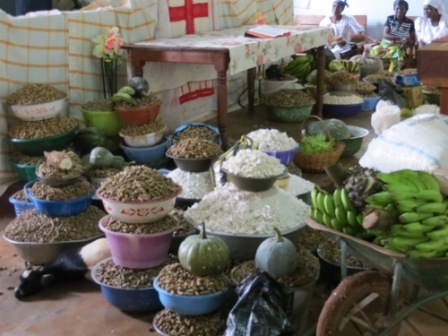 Today was harvest Sunday at the local church here, and people brought in offerings of peanuts, vegetables, fruit, manioc (their everyday staple here) and even a goat and who knows what else! 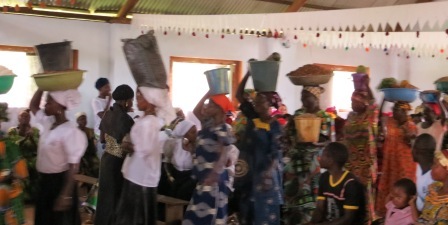 It was a noisy and wonderfully happy celebration of thankfulness to God. Kim’s prayer expressed it beautifully, “if we have wisdom, it only comes from You, if we have riches, it only comes from You, if we spouses and children, they only come from You…” I am so very thankful to be blessed with so much! I have plenty of peanuts☺to eat and can be in touch with my family at the drop of a hat thanks to our faster internet, I have friends to laugh and cry with, both believers and yet wanderers, and I have a God who loves me and values me SO much that He died for me! JOY!!!! This entry was posted in Ceremonies & church happenings, Fun. Bookmark the permalink. Hi, loved the quick connection to your blog. however I had the idea that I could connect “seko” to receive the blogs regularly as email which I’d really like. Same for prayer requests if you have a program for those. Have had my eyes tested, but I think the technician still hasn’t got it all right when it comes to distant vision though reading is fine. Just read the longest chapter in the biograpy of Kay Sundstrand which is finally off the press – dealing with writing the religion lessons and all that side of her life. But my eyes are tired – gettin’ old ain’t for sissies, I’ve heard. Hi Marian, I just read this – sorry I don’t keep up with the comments! You click on the “subscribe” up in the top right corner of the blog page, and then you’ll get the blog postings by email as I write them.